In this post, we are going to find out how the Mirasvit Gift Registry extension looks from both inside and outside. 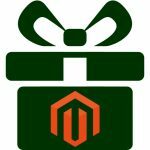 We’ve already reviewed one of its closest competitors – the Amasty Gift Card module, and there are two digests of appropriate Magento 2 and Magento 1 tools available here: Best Gift Registry Magento Extensions and Magento 2 Gift Registry Extensions. 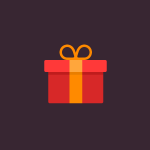 Below, you will find a summary of the core Mirasvit Gift Registry features, as well as a detailed description of its backend and frontend functionality. If you are looking for a flexible tool that will help you implement customer gift list on your Magento 2 website, give Mirasvit Gift Registry a try. It doesn’t matter what kind of goods you sell, because the extension is good for everything: clothes, toys, fashion accessories, and more. The module increases sales due to a few personality characteristics. First of all, everyone likes to receive gifts, especially for important occasions like birthday, wedding, or baby shower. But not everyone is brave enough to ask friends to give specific gifts. That’s where the Mirasvit Gift Registry Magento extension becomes useful: your customers can сreate a gift registry, place desirable gifts there, and share this list with friends via social networks. Thus, the need to ask someone to buy particular gifts is eliminated, and every shopper gets a perfect opportunity to provide friends with a delicate tip about his or her own wishes. Also, don’t forget that a customer’s friends or relatives are invited to buy gifts exactly on your ecommerce website. As a result, you simultaneously increase sales and get more satisfied customers. So, how does the Mirasvit Gift Registry extension look and feel from the perspective of admins? First of all, let’s see how the main screen with gift registries is arranged. All registries are gathered in the grid which is divided into the following columns: checkbox, ID, Registrant Name, Title, Number of Orders, Created At, Type, Website, Status, and Link. The grid supports filtering and sorting options, so you can easily find a specific registry. You can enter a necessary value in a field below the column title or hit a cell with title to rearrange the order of registries. Note that it is possible to apply several filters at a time. Most grids described below work on the same principles, so you can easily sort the information in them as you wish. Such functionality can essentially save your time. 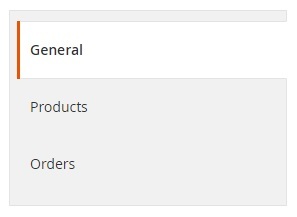 As for the Edit Registry page, it includes 3 tabs: General, Products, and Orders. The General tab is divided into the following sections: General Information, Event, Registrant, Co-Registrant, and Shipping. Such separation is very convenient because you don’t have to deal with a mess of options. 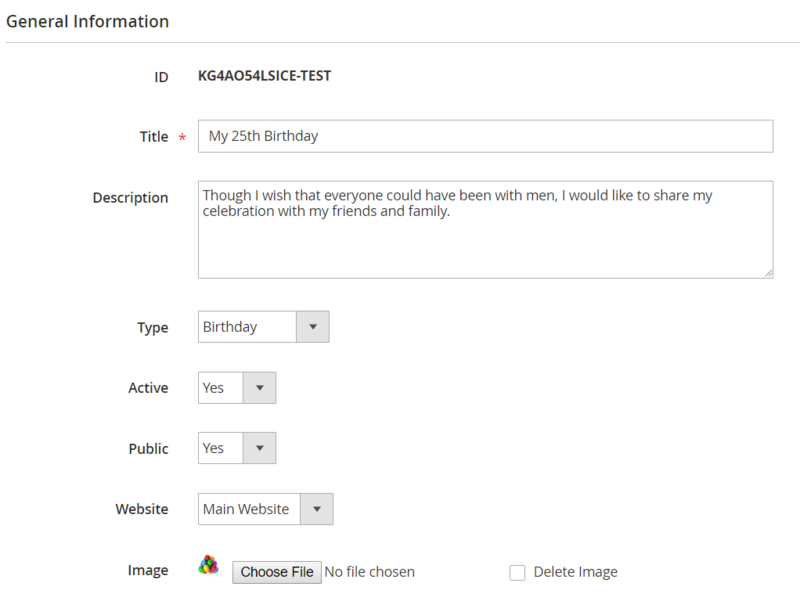 The section with general information contains the following data: a registry ID, title, description, type (Birthday, Wedding, or Baby Shower), status (active or not), public visibility, store view, and an image (you can add a new file or delete the existing one). As for the Event section, it consists of just two fields: Date and Location. The Registrant Section includes data about a registry owner: his/her first, middle, and last name and email. The same information can be specified for a co-registrant. As for shipping, you have a registrant’s shipping address here. As you see, the interface is intuitive, so you can master it without any help from third parties. On the Products tab, you have a grid with all items from a registry. The grid illustrates such information as an item ID, name, SKU, quantity, ordered and received quantities, priority, and note. You can view and edit each item by changing its quantity, ordered and received quantity, priority, and note. And as for the Orders tab, it shows all orders related to a gift registry owner in a dedicated grid. On the Item Priorities page, you can edit already available priorities or create new ones. To create a new priority, you should specify its title and sort order. 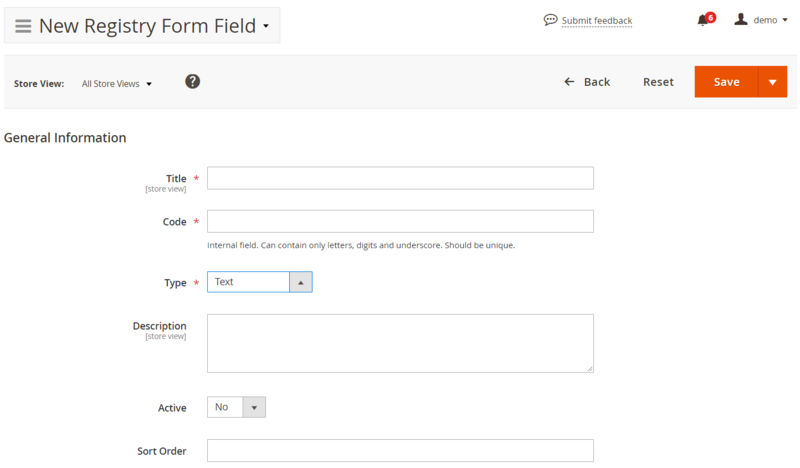 All registry form fields are also gathered in a grid that consists of 5 columns: checkbox, ID, Title, Field Type, and Sort Order. It is possible to edit already available fields or create new ones. To add a new registry form field, you should specify the following information: Title, Code, Type (Text, Multi-line text, Date, Checkbox, or Drop-down list), Description, Active, Sort Order. 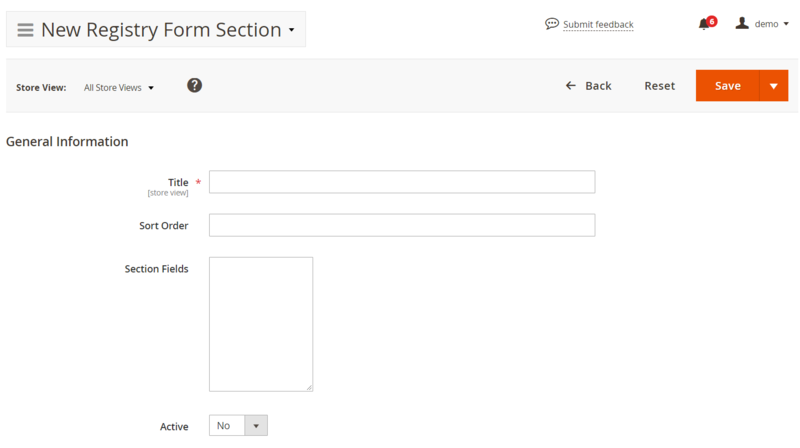 To create a new form section, enter its title and sort order and specify section fields and status. All event types are also gathered in a grid where you can add new events or edit existing ones. 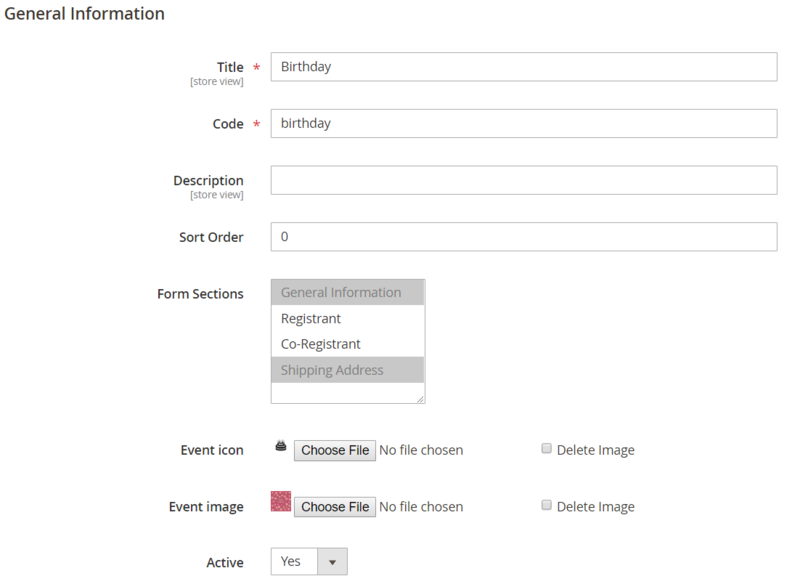 To add a new event type, specify its title, code, description, sort order, and form sections, upload an icon and image, and set the status (active or not). 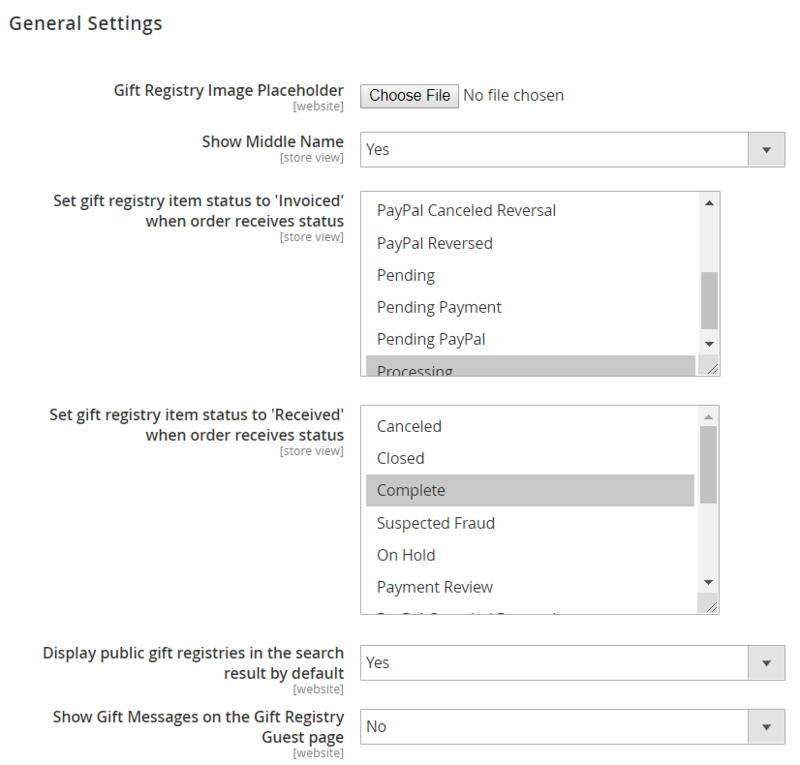 As for Mirasvit Gift Registry main settings, they are split between 2 sections. The first one is General Settings, where you can upload an image for the gift registry view page, decide whether to show a customer’s middle name, and choose when to set gift registry item status to ‘Invoiced’ and ‘Received’. Next, enable/disable the display of public gift registries in search results, as well as greeting messages on guest pages. In the Notifications tab, you choose Email Sender, Owner Notification Template, Gift Registry Sharing Notification Template, and Out Of Stock Item Notification Template. 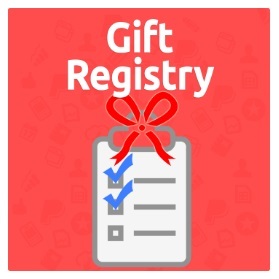 From the customer perspective, Mirasvit Gift Registry has the following look: all registries are gathered within a grid that displays registry IDs, titles, event types and dates, as well as provides the ability to preview, edit, share, and delete each registry and view items. Hit the Edit link, and you will see a page divided into the General Information and Shipping Address sections. 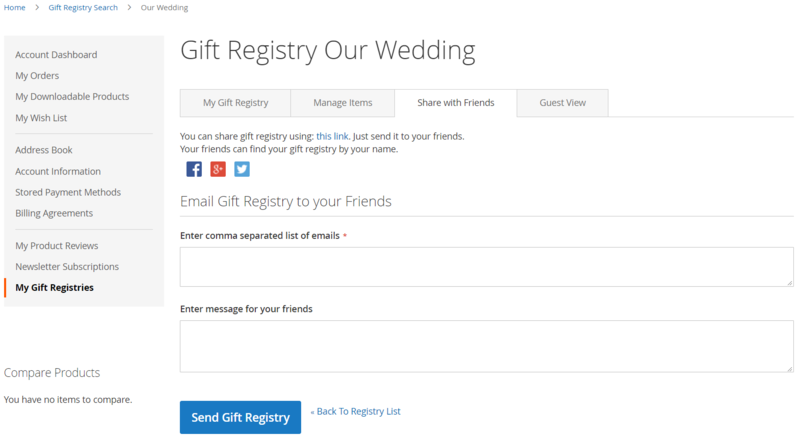 As for Share with Friends, you can share your registry using a direct link, social buttons, or email. Multiple Gift Registries and Various Occasions. 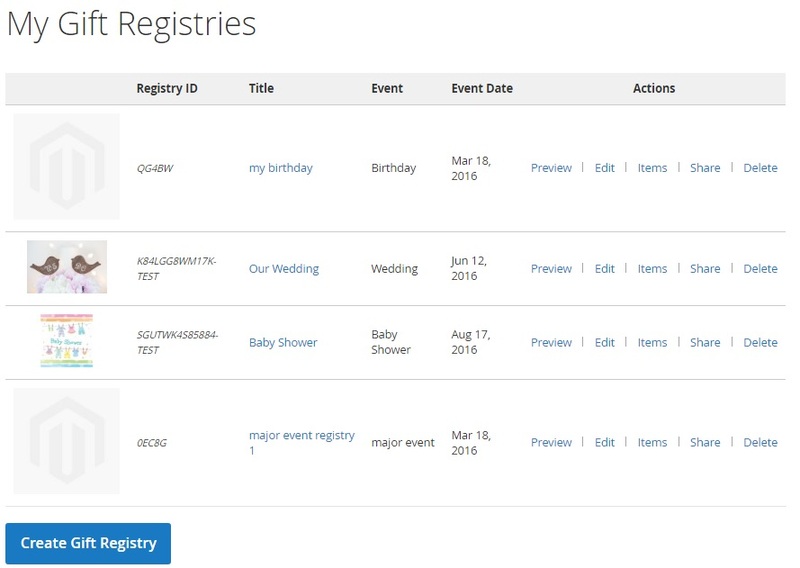 As you can see, Mirasvit Gift Registry not only allows your customers to create multiple registries but also provides you with the ability to add new events and occasions. Furthermore, it is possible to have a few lists for the same occasion, dividing all desired gifts between various groups: shoes, bags, toys, etc. Thus, you enable clients to eliminate mess in a registry, organizing their wishes the way they want. Intuitive Interface. As you can see, the Mirasvit Gift Registry Magento extension has an intuitive interface, so both your admins and clients can easily manage gift lists. The module lets them rapidly create new gift registries and manage items there, share gift lists with friends, and view how other people see them. Clients are free to enhance every registry with such details as event type, description, date and location, registrant and co-registrant data, and shipping address for delivering gifts. Gift Registry Items Management. You customers are free to manage their gift list’s items features. For instance, Mirasvit Gift Registry for Magento 2 and 1 enables them to select an item priority, specify quantity, and add notes. Consequently, buyers can easily understand how important each gift is. Sharing. Sharing with friends is also very convenient since your customers can inform friends about gifts in just one click via Facebook, Google+, or Twitter (there are appropriate buttons available on the sharing tab), direct link, or email (it is possible to send several emails simultaneously). Adding New Products. Gift Registry works well with all Magento themes, so your customers can add items to their gift lists in just one click with the help of an appropriate button which is available on each product page. It is only necessary to hit this button and choose a list to which an item should be added (alternatively, it is possible to create a new one). 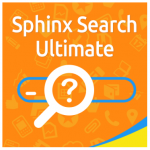 Simple Search. The Gift Registry module offers two different searching modes. First of all, your customers can use a registrant’s first and last name to find public gift registries. Alternatively, it is possible to access private gift registries with the help of the gift registry identifier. Both modes require entering data into appropriate search boxes located nearby. Guest View. All guest visitors can review a specific registry via a link received from the registrant. Mirasvit Gift Registry for Magento 2 and 1 enables them to buy a customer’s desired items right there. It is only necessary to mouse over a gift and then click Add to Cart. Customizable Gift Registry. As we’ve mentioned above, the module lets you fully customize gift list grid view on the frontend. You and your admins can easily activate/deactivate and add/delete fields, set the sort order, as well as choose mandatory fields. Furthermore, it is possible to create unique fields for each event type. Unlimited Occasions. Since the number of occasions is unlimited, feel free to add more events to the list of default ones. Customize the event list according to your business requirements and customer needs. Increase sales (friends and relatives are always the best converters, so you can easily get a lot of new customers with Mirasvit Gift Registry for Magento 2 and 1). Mirasvit Gift Registry for Magento 2 and 1 offers a beneficial improvement to the default Magento functionality. Both versions of the platform do not provide any reliable analog, so Mirasvit Gift Registry is a must-have extension for those merchants who want to improve current customer experience and increase sales. The module costs $349, but now you can buy it with a discount for $279.